More Thorreblot! This time the miscellaneous meat-leavings after all the testicles and rotted shark have been dispensed with. On this occasion I was privileged enough to attend a real-life Thorreblot celebration local-style, which involved lots of vodka and villager-type entertainments as well as plates laden with putrefied basking shark and many-bits-of-sheep. My plate here shows both why I never intend to try out for professional photography and the various sheep-heady brain jelly type bits and pieces which make up the mix. Sheep’s cheek – much as you would expect – fairly dry and a lot like other types of meat. But I was not quite as enthusiastic as the locals how picked the entire skull clean. Brain jelly was like a meat jelly really, not much else to report. If you like jellied meats then it was pretty good. If that’s not your thing (not mine) then it’s not horrible, but you’re better sticking to the vodka. 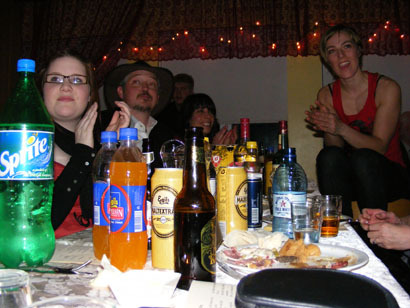 Certainly the Icelanders threw plenty of vodka down whilst we all watched local villagers perform very entertaining skits about local life. 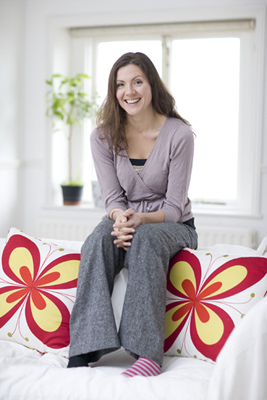 In my vodka addled state I like to think I understood some of it. So begins my culinary tour of Iceland at a time when the locals are digging in for some of the least savoury cuisine of the year. 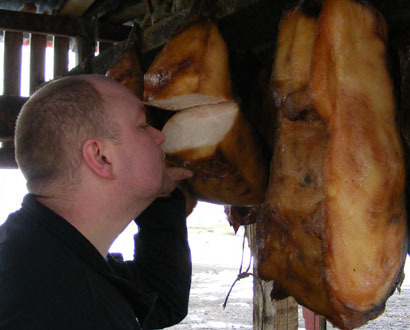 Mid-winter is ‘Thorreblot’ time in Iceland, which roughly translates as the time to eat the animal parts which are otherwise forgotten about. 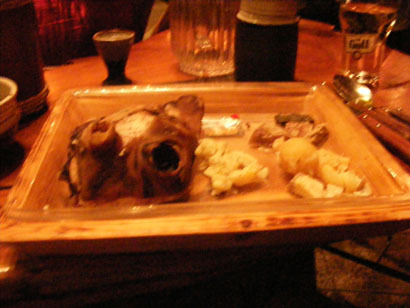 Testicles, brains, cheeks and other innards make it onto the menu, but most infamous is Iceland’s putrefied or rotting shark meat. This food was personally singled out to me by a floppy haired TV chef whose name escapes me as ‘the worst thing I have ever eaten’ and it made Gordan Ramsey actually vomit. So it would be fair to say I was intimidated. 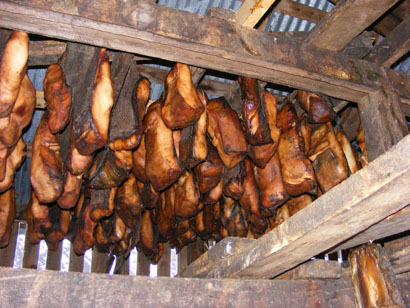 The place to eat rotted shark in Iceland is the prime (only) site of manufacture – a tiny small-holding to the north of the country which catches and rots the shark ready to eat. You can smell the place long before you see it, and the aroma of rancid urine piques the nostrils if not the appetite at disturbingly heightening levels the closer you get. I met with the very accommodating owner, who took me to see the hanging meat, and cut me off a good size wedge fresh from the shark. The meat is a beautiful white/yellow colour and looks so much like cheese you’d be forgiven for mistaking the two – with the exception, of course, of the ammonia vapours tunnelling up from the rotted flesh. I took a small piece, swallowed rapidly, and found it really wasn’t that bad – like strong cheese. Emboldened I made for a larger piece. Big mistake. This bit was sizable enough to need chewing and the texture is of toughened plastic. Ammonia streamed up my nose, making my eyes water as I tried to choke the meat down. But it wasn’t bad enough to gag – Gordon was over-reacting. Or possibly, given his career, in ownership of a finer palate than mine. Bjarnahöfn shark farm, on the Snæfellsnes Peninsula, near Stykkishólmur. There are only three settlements in the north of the country so you won’t have a problem finding it – just ask a local and follow your nose. 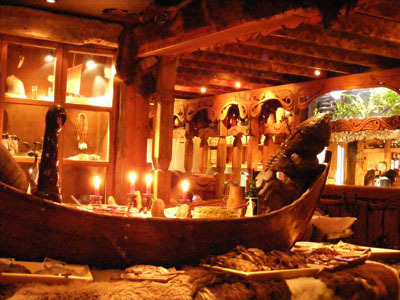 It’s about six hours drive from Reykjavik. 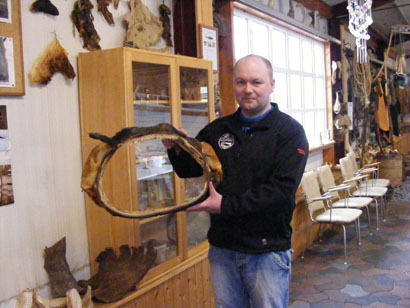 Continuing in my Thorreblot (mid-winter animal innards-fest) tour of Iceland I’m expanding beyond rotting shark and deeper into parts of sheep more usually made into hot dogs. First up is sheep testicle terrine – a smooth blend of testicles with some other bits of offal and plenty of lard to stick it all together. As with my other experiences of testicles (culinary, obviously) the taste is pretty good. And the terrine presentation made it in many ways more palatable. Overall though, the dish comes with some quite strong spices which ruins it for me, and I didn’t eat more than a few mouthfuls. Being as the traditional Thorreblot spread doesn’t vary much past pastes and pates of sheep innards, however, I found myself returning to it as a means of filling up. Generally though I stuck to the bread. 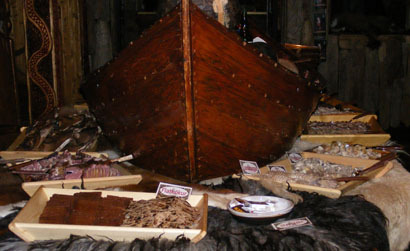 This particular Thorreblot-style buffet was found as the Viking Hotel just outside of Rekyavik, and they also do Viking kidnaps for bored corporate types (seriously – your party arrives and are ambushed and carted off by men in horned helmets). 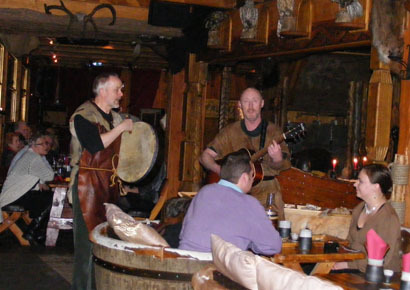 The hotel also augments the nightly dinner offering with Viking style musicians, which whilst not taking away from the general un-palatability of the food, had a commendable grip on the ridiculousness of their jobs.